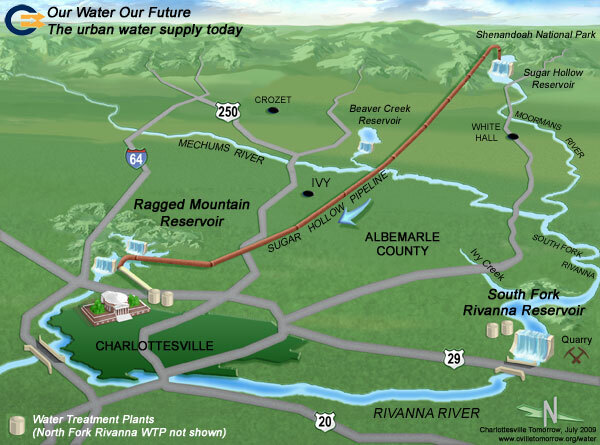 Charlottesville-Albemarle's water supply is provided publicly by the Rivanna Water and Sewer Authority (the "RWSA") or privately through wells and other groundwater sources. Sugar Hollow Reservoir, formed by the Sugar Hollow Dam on the Moormans River. Ragged Mountain Reservoir, which receives water from Sugar Hollow via the Sugar Hollow Pipeline. South Fork Rivanna Reservoir, on the Rivanna River. Additionally, the Beaver Creek Reservoir, formed by the Garnett Dam on Beaver Creek, supplies water for Crozet. The actions of the RWSA and are guided by the Community Water Supply Plan, which must be endorsed by local governments. ↑ Web. Adding Flourine To Water Supply Urged, Staff Reports, Daily Progress Digitized Microfilm, Lindsay family, June 14, 1950, retrieved November 4, 2017 from University of Virginia Library. Print. June 4, 1948 page 3.